First, accessing these style changes requires going through a cumbersome series of steps that most people will never bother to use, even if they manage to figure it out (see Macworld’s review of iOS 5 for all the gory details). Having a Bluetooth keyboard is of no help; Command-key shortcuts for these options don’t work. 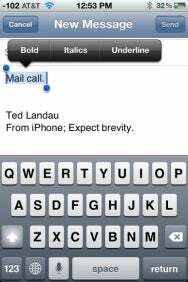 Mail in iOS 5 allows you to format text, assuming you can find where these options are hiding.